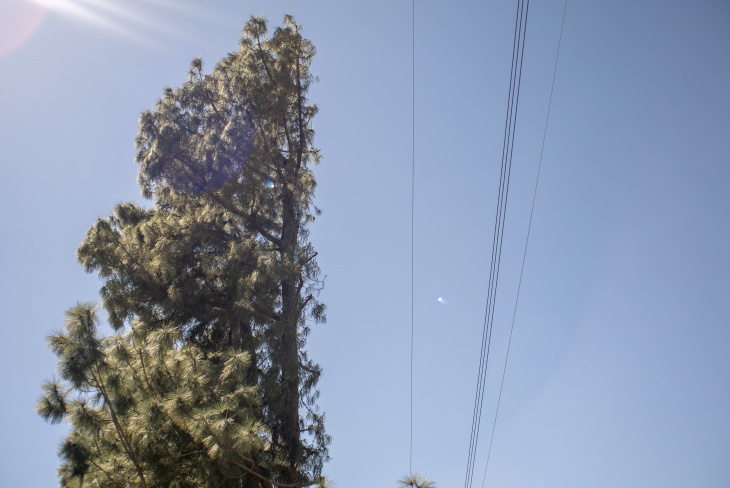 Altadena residents' startled and angry responses to the cutting could be repeated in the other fire-vulnerable parts of Edison's vast service area — because over the next two years, the utility is mounting a massive new tree-trimming campaign. It's aimed at reducing the risk that its power lines might spark new fires — in which case, Edison could have to pay billions of dollars in liabilities. "Look at this tree. The whole side of this tree is hacked off! Now it's not likely to live," resident Liz Culpepper said, as she confronted a tree crew supervisor and recorded the exchange on her phone. 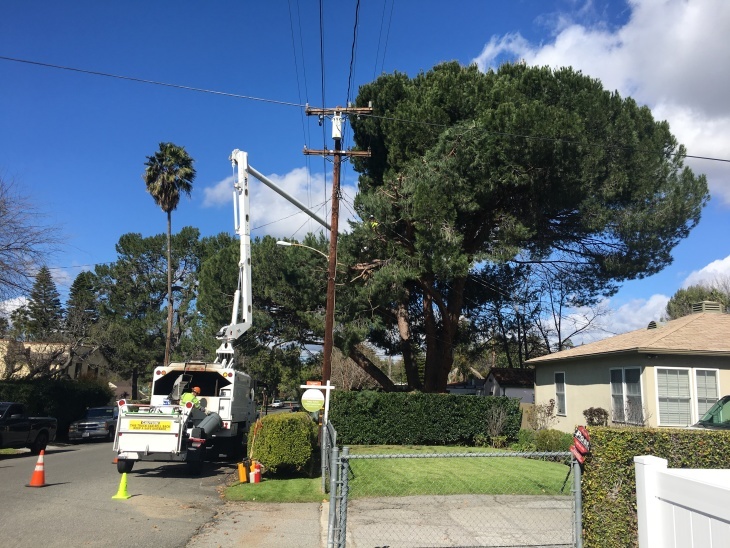 An SCE-paid work crew had cut back to the trunk every single street-facing limb from two very tall, 80-year-old pine trees. Up and down the block, other trees had also been deeply cut back from power lines. Limbs that hung over power lines were also cut in some areas. The crew supervisor on the video said he had a new law on his side that let his workers cut trees 12 feet back from any power line. 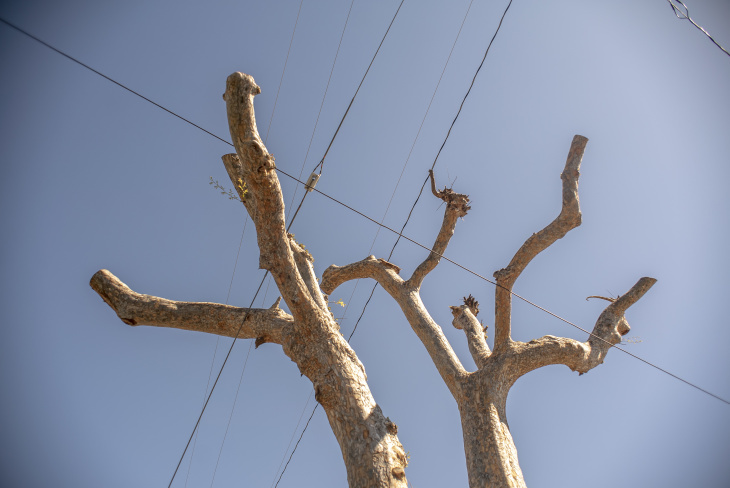 "The branches protruding towards our high voltage conductors could not be cut in half, they had to be trimmed to the tree trunk" to avoid leaving a stub that could promote decay within the tree, said Edison spokesman David Song. "This type of cut is the healthiest situation for the tree while achieving the compliance requirement," he said in an email. Residents disagreed. "Literally, they butchered the trees with the intention of killing them," said Greg Williams, pointing to trees near his Glenrose Avenue home that had been denuded of branches. "And that's what people up here in Altadena are upset about. They didn't cut them, they butchered them." The lush tree canopy in the hilliest, most fire-vulnerable parts of Altadena have been getting a deep trim over the past month. But the unaccustomed limb-chopping has residents so angry, they called local and state politicians, who in turn, called a town hall meeting. There, Edison CEO Pedro Pizarro told them he must put his power lines ahead of their trees. "We know that homeowners care deeply for their surrounding environment and for their foliage, and we want to respect that," Pizarro said. "However we will prioritize the safety of your home and our communities, first and foremost. So, we will trim trees when needed." 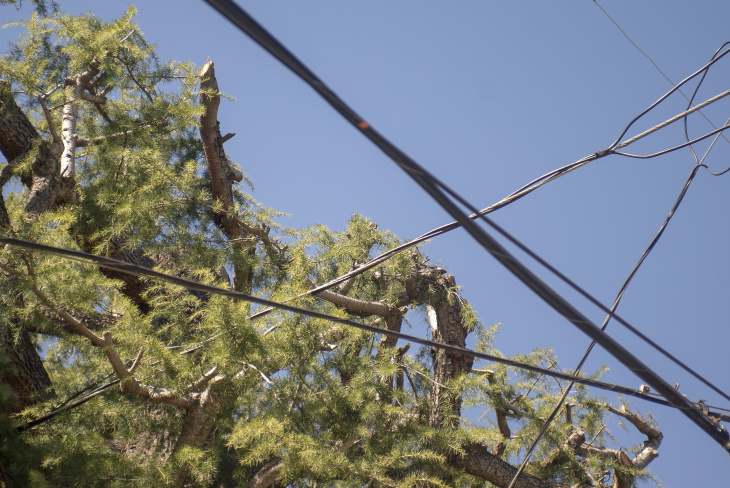 He added that the company needs to raise public awareness about the danger that power lines contacting trees presents to the power system and to their homes. "I'll be honest with you, this is an area where the public awareness is improving and increasing, but more needs to be done," Pizarro said. WHY IS EDISON TRIMMING TREES MORE AGGRESSIVELY? As part of its fire mitigation plan filed in February, the utility says that it is undergoing a comprehensive redesign and restructuring of its vegetation management program. It's being rolled out in stages, starting this year. And it includes an increased focus on taking out any tree that puts its branches close enough to touch a power line — and potentially spark a fire. The new tactic is a response to to California's heightened fire danger. Fire season can run nearly year-round, due to climate change, years of drought and an overload of flammable vegetation and trees in foothill and mountain communities. The company says that cutting back trees near power lines also makes the community safer because it reduces the amount of vegetation that could set homes on fire. Southern California Edison's equipment was recently blamed for starting the massive 2017 Thomas Fire, which began near Santa Paula and burned through Ventura and Santa Barbara counties, killing two people and burning more than 1,000 homes. One month later, a torrential rain in the mountains above Montecito caused a disastrous mudslide that damaged or destroyed hundreds of homes in the coastal community and killed 23 people. The company has said it could end up paying nearly $5 billion in damages in the two disasters. HOW IS THE NEW TREE-TRIMMING AND CUTTING PROGRAM DIFFERENT FROM BEFORE? Three new things are going on. In 2017, state standards for clearing around power lines increased from a mandatory 4 feet up to a recommended 12 feet. Also, Edison will clear all trees and brush directly under power lines that could potentially grow into the 12-foot clearance zone. That's why Altadena neighbors and others are seeing deeper trims than were previously done. Under state law, Edison has always had to trim branches near power lines and take down dead and diseased trees. 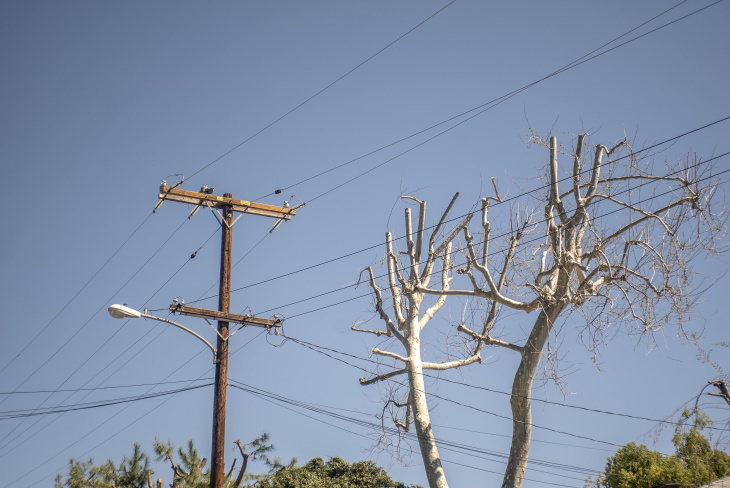 But Edison's new Grid Safety and Resiliency Plan targets healthy trees. Over the next two years it plans to cut down 22,500-45,000 healthy trees that could fall or blow into power lines, even if those trees are as much as 200 feet from those lines. 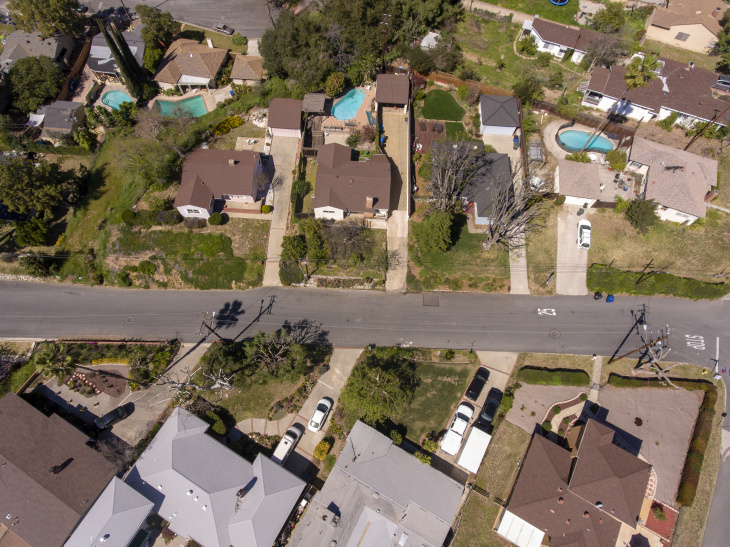 Finally, a new state law, AB 2911, gave Edison unlimited access to private land to prune or remove trees from around power lines. Utilities are supposed to tell the owners before they trim, but they no longer need to get permission. WHICH AREAS WILL BE MOST AFFECTED? The top priority for trimming trees is in areas that are in Tier 2 and Tier 3 of this fire risk map, filed with the California Public Utilities Commission. And the footprints of those higher risk areas has expanded in the past year, so some areas that had not previously seen deep trimming may be seeing it this year, said Edison spokesman David Song. Cutting is already going on in La Cañada-Flintridge, La Verne and other hillside communities. In all, more than one-third of Edison's vast service area has places where fire risk is elevated or extreme. BUT THE CUTS CAN BE UNSIGHTLY. WHAT CAN TREE OWNERS DO? 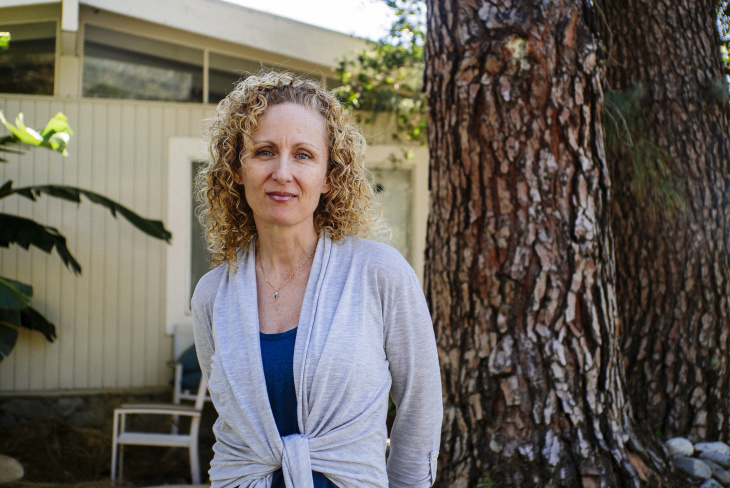 Company spokespeople say owners could have avoided unsightly trims if they had kept their trees from growing into power lines, or planted different trees decades ago, mindful of how big they might eventually grow. The company has a "Right Tree, Right Place" brochure to help people choose trees less likely to interfere with power lines. And if you're really into the nitty-gritty of the rules Edison follows when trimming trees, they are filed with the California Public Utilities Commission (See Order 95, Rule 35, Table 1, Case 14 for high fire risk areas) And the state Public Resource Code section 4295.5.